Nothing wrecks an awesome hiking trip like coming unprepared. 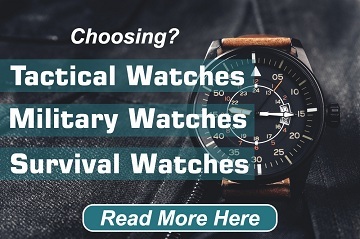 The hiking gear you use factors into your experience just as much as the trail does, and when referring to gear we aren’t just talking about a nifty watch and some trekking boots. Inexperienced hikers will sometimes make the mistake of overlooking the basics. Yes, gadgets are nice and of course it is dire to have quality footwear, but keep in mind that coming prepared to a hiking trip likely means investing in some hiking pants as well. So before you learn the hard way, for example by getting chilled to the bone in a pair of blue jeans or walking through a patch of poison ivy with some cargo shorts on, let’s debrief and take a moment to go over what a good pair of hiking pants looks like. As a bonus we will even include our picks for the best men’s and women’s hiking pants of 2019. The three essential components that all good hiking pants encompass are durability, comfort, and freedom in range of motion (aka mobility). When you invest in a pair of hiking pants you want them to be able to withstand the elements. A durable pair will be made of strong, resilient fabric and likely weatherproofed. True hikers’ clothing is durable and reliable. Defense against the weather is also a key detail when it comes to comfort. 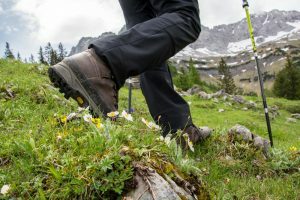 Pants that are not only comfortable to wear in the colder and wetter months, but also have the versatility and breathability to be worn in the summer are pants that you can rely on for your hiking adventures. Versatile pants are important because although it’s good to scout the weather for your hike ahead of time, we all know that temperatures and conditions can change unexpectedly. It makes much more sense to invest in one pair of versatile pants then multiple pairs that only work for varying conditions. Going hand in hand with comfort is freedom in range of motion. Hiking involves constant movement and can require a lot bending, turning and twisting as you navigate a trail. Pants that keep you bottled up and restrict your movement are just plain unsuited for adventures. 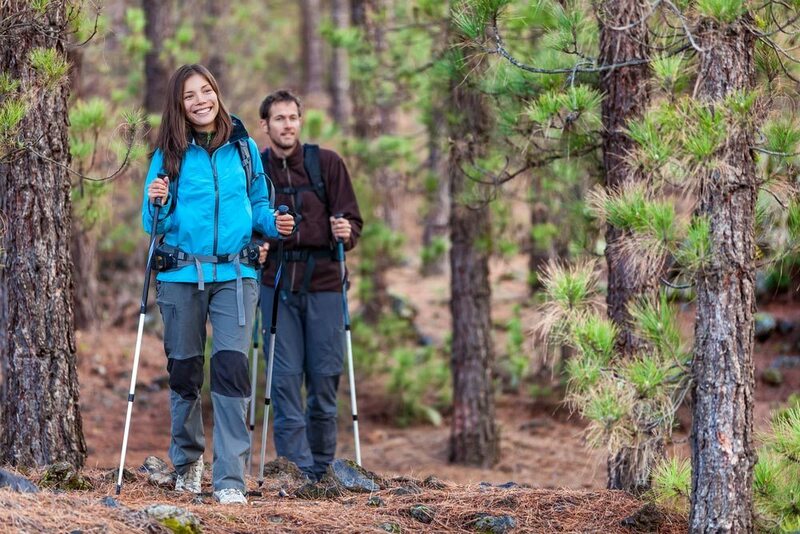 You need to be able to move freely and comfortably at all times, which is why pants that bend and stretch with your body are a prime choice for any serious hiking journey. If you can find yourself a pair of pants that are durable, comfortable, and flexible then you can also keep an eye out for a few other features. Additional pockets, reflectors, and adjustable waistlines may come in handy. Appearance and price may also factor into your decision; just make sure you don’t sell yourself short in terms of quality for a less expensive or more fashionable pair of pants. As promised, here are the best men’s hiking pants on the market right now. They have varying benefits and some are more appropriate for certain conditions than others, but overall these are all good choices. It may sound silly but hiking can be coarse and sometimes hiking pants can match that toughness, which can hard on the skin. Salomon was aware that not every hiker is built the same when they invented the Wayfarer. Made of 86% nylon and 14% elastan, these pants are tough on the trail but soft on your frame thanks to Salomon’s skin shield technology. If you’re intent on having a pair of pants that you can hike in that will also be gentle on your skin, the Salomon Wayfarer may be the way to go. Note, however, that some users have cited the pants’ mid areas may fit a little tight. This Marmot brand of hiking pants is not only convertible, which makes them versatile and useful for various situations, they are also quick to dry and work well even in winter conditions. 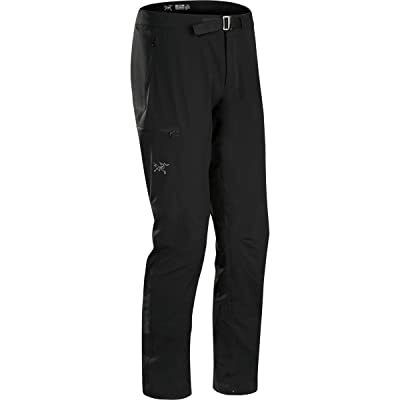 There are not only zippers at the knees to convert the pants to shorts but zippers at the ankle cuffs which make the pants compatible with ski boots. The Marmot Cruz Convertible is great for all sorts of situations but due to such versatility and only average scores in the durability department, the pants will likely wear down after some serious, repeated use. Pants that work great for everything will undoubtedly get over-worn. Nevertheless, they are a good, versatile and weather combatant option that should provide many successful wears. With unique Schoeller 3XDRY fabric, the Mammut Base Jump Advanced II pants are capable of repelling both water and heat. The fabric is decent on the skin and flexible to the bend of your body. You’ll probably want a belt however as there is no waist adjustment built into the pants. If you are expecting heat and rain on your next hike, you’ll be well equipped if you get yourself a pair of these. Much like a weatherproof jacket, these pants will shed water, snow, and sleet without an issue. They look good and have a silky feel too. The issue that users may run into however revolves around wear and tear. Scrapes and scuffs could wear the Gamma’s exterior fabric prematurely. These pants excel against the climate but not the terrain, which is an interesting tradeoff. These pants are useful for just about any terrain. 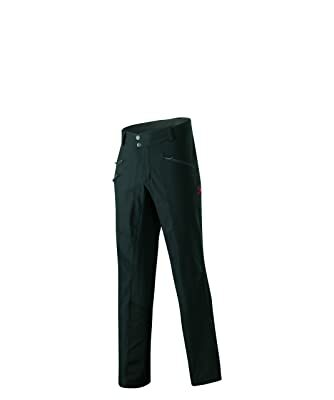 Made of G-1000, a patented cotton and polyester blended fabric; these pants won’t give way to nearly any environment. Cold weather, rocky climbs, thick brush, and other harsh conditions are no match for these pants that are also quite breathable and well ventilated. Of course, all of this praise comes with a price, literally. These pants can be nearly as tough on the wallet as on the trail, but they might just be worth it. Although composed almost entirely of nylon, the Prana Stretch Zion has some elasticity to it since there is a bit of spandex built into the fabric. This means you can move into all sorts of positions and take lengthy strides and high steps without feeling restricted. However, the pants also tend to fit snugly which means that you can expect them to be cozy — sometimes too cozy. Extremely hot conditions probably won’t go well with these pants as there is not much breathability or ventilation to them despite their flexibility. 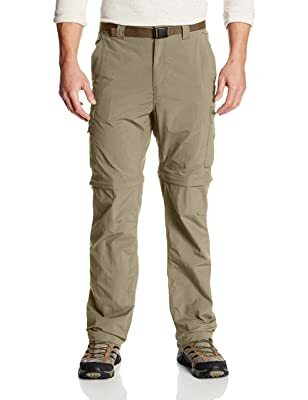 If you’re the type of hiker who likes to carry quite a bit of tools and other items on you during your adventures then these pants aren’t a bad option. With multiple pockets on both sides of the pant, you will be able to carry your GPS, a few power bars, and even a pocket knife comfortably. The pants are well ventilated and work well in hot conditions. They do tend to be a little baggy however and aren’t the most durable, but they should do the trick for many hikers. 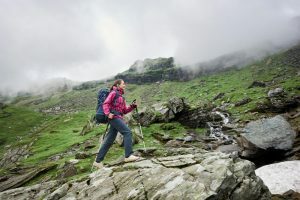 Just as there are a variety of great hiking pants options for men, there are just as many for women. These wonderful options are designed specifically for women hikers with more feminine fits and comfortable designs. 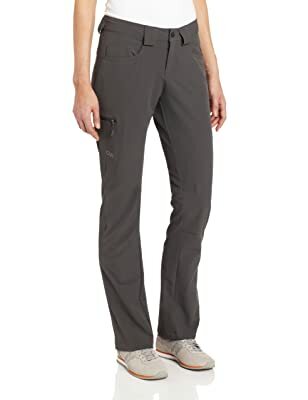 This Marmot women’s pant is a perfect example of how hiking pants can be durable and comfortable at the same time. 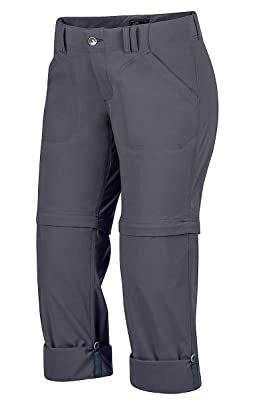 These pants are resistant to abrasive wear and tear and are also comfortable enough for almost all weather conditions. This is in part due to their convertibility to shorts with zippers at the knee however it is those very zippers that at times can start to annoy the wearer as they bounce off their legs. That is the only notable complaint however and these pants are a solid and versatile choice. If you are looking for function that doesn’t sacrifice fashion then here might be your choice. The Prana Halle hiking pants are composed of a nylon and spandex blend that provides stretch and mobility and they resist abrasiveness well. The feminine fit of The Prana Halle is refreshing to those who don’t want the hiker look coming off them too strongly. The catch with these pants is that they don’t do very well in wet conditions, which is a bit of a shame. 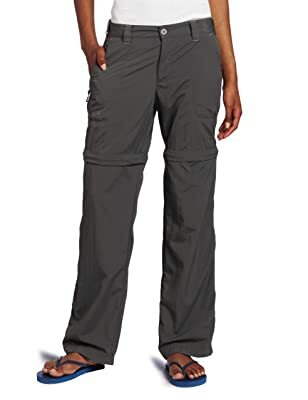 Not only are these pants water resistant and rapidly drying, but despite being a convertible pant they pull off a great feminine look for hiking pants. The reason is that the waist sits higher and the pants convert to shorts higher up on the leg than rival pants do. 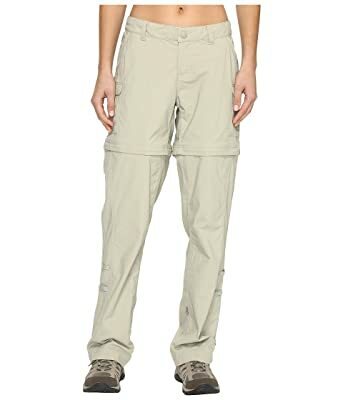 If you prefer a higher waist and shorter shorts then you will love these pants, however, if that’s not your style then try the Marmot Lobo’s instead. 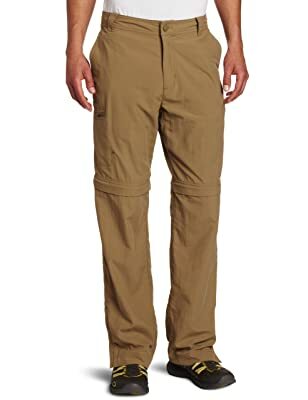 Yet another hiking pant that can convert to shorts, these pants have breathability and allow you carry a few extra gadgets with their deep cargo styled pockets. The primary shortcoming however is that the pants are tight at the zipper. This may restrict your range of movement a bit and could cause some mild discomfort. Mix “fashion over function” with a nice price tag and you get these pants. They are great for easy hikes and warm weekend retreats with their flexible build, however, they can’t convert to shorts and they are not water resistant by any means. These pants are perfect for the occasional hiker (as the name might suggest) who won’t mind another nifty option in their wardrobe as a bonus. They aren’t too expensive which is a plus as well. They are mobile and wear nicely in warm weather, but the added pockets cargo pockets down the sides are a nice addition too. Unfortunately, all of this utility and function is a bit ruined by a lack in comfort that comes when you wear the pants with a hip belt. There are internal buttons inside the pants that will get pressed into the wearer if they fasten on a belt. This is literally a pressing issue. Despite being fairly cheap, these nylon woven pants are pretty good against water and they offer convertibility to shorts. They aren’t top of the line by any means but a casual hiker who isn’t in the mood for getting wet might benefit nicely from them. Maybe it took a bit of magic, but somehow Outdoor Research made a stunning pair of pants that not only has a great feminine fit to them, but are also extensively durable against the terrain. Wind resistance, water resistance, and abrasion resistance are all key features of these pants however when the weather gets truly chilly these pants don’t quite do the trick on their own. Match them with another layer though and you might just be unstoppable against the elements. With so many options to choose from and so many trails to explore, you’re bound to have to really awesome hiking adventures come your way soon. Remember, it all starts with the proper gear, and hiking pants are an important piece of a hiker’s outfit. Look for comfort and a fair price, but don’t forget about function and durability. You never know where your next adventure might lead, so get yourself pants that can withstand the elements and offer you mobility as well. Have fun shopping and more importantly, have fun hiking.